This Blu-Ray disc from C major is both a fascinating historical document and a first-rate performance of Parsifal. 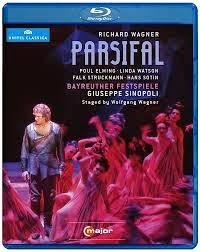 From a historical perspective it gives a unique insight into Wolfgang Wagner’s final Parsifal production and is one of the few testaments we have of Giuseppe’s Sinopoli as a Wagner conductor (the only other complete Wagner performances that I can find are a Flying Dutchman from 1998 and two Tannhauser, one from Bayreuth). From a musical point of view, there is powerful conducting and some very good individual singing, in addition of course to the habitually high standards of the Bayreuth Festival Orchestra and Chorus. Overall this is a strong performance, and definitely one of the best available on Blu-Ray. Giuseppe Sinopoli succeeded James Levine as Bayreuth’s Parsifal conductor. Levine’s reign lasted from 1982 to 1993 (with Daniel Barenboim taking over for a year in 1987). Sinopoli conducted Parsifal for six years from 1994 through 1999. The staging by Wolfgang Wagner seen here made its first appearance under Levine in 1989. The performance seen here comes from 1998 and was released for the first time on DVD in May 2011. This review is of the Blu-Ray, released in 2014. Sinopoli’s conducting is expansive. The Prelude comes in at 13’47”, which is slow but not super-slow. But the drama as a whole takes 4 hours 39 minutes, several minutes slower than Levine’s famously slow 1990 recording – and just a couple of minutes quicker by Toscanini’s 1931 Bayreuth performance. The Prelude to Act III show’s Sinopoli’s approach to good effect. It is measured, but not slow for the sake of slow. The tempi set the forward movement for Act III. Sinopoli’s conducting is commanding where it counts (particularly in the two great choral scenes in the outer acts) and he brings out many details of the score that remain buried in other performances. Each of the two transformation scenes is very effective. The Good Friday Music, in particular, flows naturally from the pacing of the act, rather than emerging as a set piece. Wolfgang Wagner’s production is appealingly simple, clearly looking back to the Neue Bayreuth productions of the 1950s and 1960s. In Act I the forest is suggested by backdrop structures of stacked green polygons, which eventually part to make way for a vaguely Egyptian-looking Temple with a floor abstractly patterned in octagons. The patterned floor is a constant through the other two acts, and the abstract structures return for Act III. Variation comes with the lighting, which is used to very good effect (as in Wieland’s productions). In Act III the glowing grail casting a luminous red light on the costumes of the knights is particularly memorable. There is one truly outstanding performance here – Falk Struckman’s Amfortas. Struckman captures Amfortas’s declining authority in Act I without making him seem decrepit and he certainly steals the show in Act III. Not only is he in very fine voice, he is the only member of the cast who could really be described as acting. The others typically stand and sing. In some cases they sing well. Hans Sotin is a magisterial Gurnemanz, with “Titurel der fromme held” approaching Hans Hotter’s level (helped by Sinopoli’s luminous conducting). Poul Elming portrays the boisterous and confused Act I Parsifal well. But although he sings powerfully in Acts II and IIII (particularly after baptizing Kundry) Parsifal doesn’t seem to have acquired much depth or wisdom. This is partly a problem of acting, but also reflects shortcomings in characterization. The same can be said of Linda Watson, here making her first Bayreuth appearance. She has a fine voice and sings well, but does not really get to grips with the complexities of the role. During the Parsifal-Kundry encounter in Act II the real drama takes place in the orchestra pit. Ekkehard Wlaschiha is a forceful Klingsor (despite wearing what looks rather like a Stanford PhD gown!) and Matthias Hölle’s off-stage Titurel is effective. This performance is more than good, although not quite great. The Blu-Ray picture is very impressive (despite the disclaimer on the box), as is the sound quality. This disc should be in every Parsifal enthusiast’s collection. Nagano on Bruckner 9 at GSOplay.